To mark his 100th day in office, President Donald Trump made several public appearances and released a campaign-style political ad. 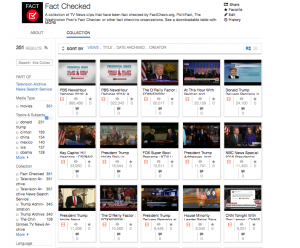 Here are some fact-checked claims from those televised interviews, speeches, as well as the ad, all viewable and shareable on the TV News Archive. President Donald Trump put his stamp of approval on this ad, which includes several factual claims. Among them: “Fact: 500,000-plus jobs created,” and “America becoming more energy independent,” while the words “Keystone Pipeline” are shown on screen. “Using just the two months on his watch–February and March–the U.S. economy created 317,000 jobs, not 500,000,” reported Louis Jacobson for PolitiFact. “Samantha Gross, a fellow at the Brookings Institution’s Energy Security and Climate Initiative… notes that she doesn’t think approving the pipeline was a bad decision… ‘We’ve made it easier and efficient to ship that crude down to the states,’ though [sic.] the pipeline, ‘but as far as changing energy independence, I don’t think so,’ she said,” Lori Robertson reported for FactCheck.org. An amendment was proposed since then, and Glenn Kessler summarized the new proposal for the Washington Post’s Fact Checker, writing, “if the bill ever became law, much would depend on unknown policy decisions by individual states–and then how those decisions are implemented.” This proposal had a House vote yesterday, Thursday, and passed. 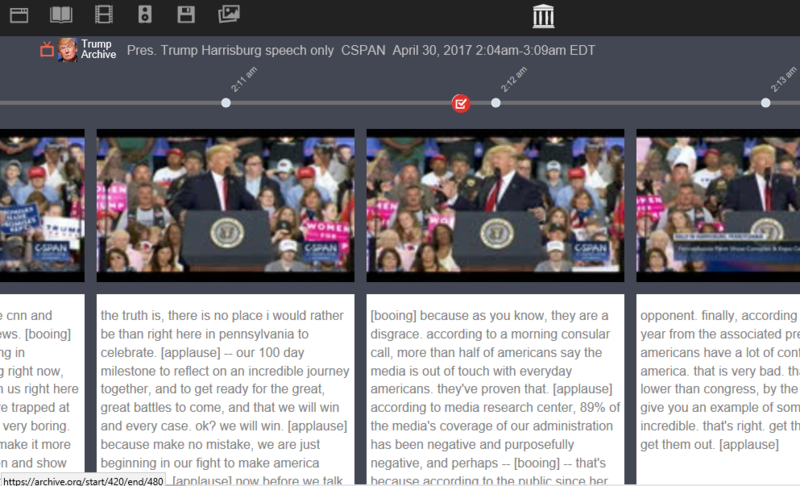 To review the 100 days interviews and speeches yourself and grab the clips you want, check out this Fox interview in two parts, the Harrisburg, PA speech, the NRA address, the Face the Nation interview in two parts, the “CBS This Morning” interview in two parts, and Trump’s weekly address. Trump’s Harrisburg address, as seen in context in the TV News Archive. Note Trump icon on top left, showing this show is part of the Trump Archive. To peruse all the fact-checking work our partners have done on statements made on TV and archived in the TV News Archive, take a look at this table of more than 800 fact-checks of Donald Trump, his administration, and some congressional leaders. This collection will continue to grow as we develop the congressional collections, add more administration official statements, and integrate new statements and reporting. This entry was posted in Television Archive and tagged Canada, Donald Trump, Factcheck.org, Keystone Pipeline, PolitiFact, Supreme Court, The Washington Post's Fact Checker. Bookmark the permalink.